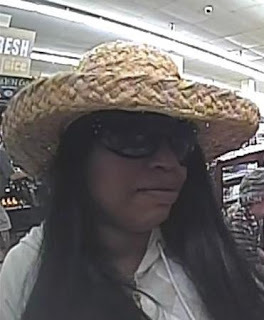 A pint-sized, sun hat-loving serial bank robber who has been targeting TCF Bank branches within local Jewel-Osco stores has struck for the third time this month. The latest hit came at 3:10 Saturday afternoon at the TCF Bank inside the Jewel-Osco, 4355 N. Sheridan Road, in Uptown. As in the two previous hold-ups, the woman handed the teller a note that said the offender was armed with a gun. No firearm was seen in any of the incidents. The suspect is described as a black woman in her mid-30’s to mid-40’s who stands about 5’5” tall and weighs about 200 pounds. The FBI says she is also responsible for robbing the TCF bank inside of a Boystown Jewel-Osco store on August 5 and the TCF inside of Jewel at 5343 N. Broadway on August 14.